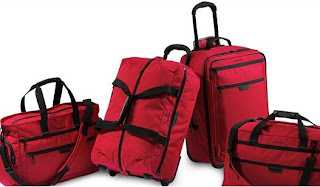 A few months ago I had previewed the Lands' End FlightWise™ Luggage Collection, which is comprised of six pieces, all meeting airline carry-on requirements. The pieces are lightweight, made with durable 600-denier ripstop fabric, available in five stylish colors - black, dark sapphire, chili pepper red, canyon orange and arctic gray. The collection features a 22" wheeled upright ($169.50), carry-on duffel ($69.50), carry-on wheeled duffel ($129.50), soft sided bag ($79.50), trip tote($59.50) and backpack ($79.50). 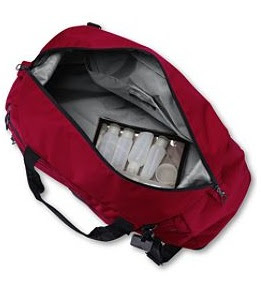 Each piece comes with a handy travel kit - a clear zipper bag with reusable, TSA approved plastic travel containers. I was excited to receive my chili pepper red carry-on duffel last week, monogrammed with my initials. There's a zipper around the base that allows the bag to expand (which is great because I tend to overpack!). When I fly I tend to want to take my wheeled upright and laptop bag with me, but for weekend or road trips, I prefer to take a duffel. 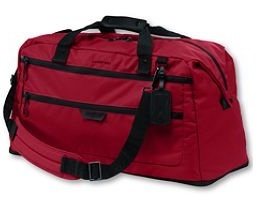 So I can't wait to use my new duffel on my next trip!